You may submit comments on the above topics to the open docket by April 26th, 2019. They will be part of the FDA record on the risks of breast implants. Please know all submissions will be public. Refer to FDA Public Advisory Committee Meeting Information for the Public page 2, under Open Docket. See this website’s FDA information page for more information including a link to watch both days. If you have symptoms of breast implant illness please report all adverse reactions to your country’s health government agency. 1. Breast implant illness can be reported by anyone (patients, health care professionals, manufacturers, etc.) to the FDA through the MedWatch Online Voluntary Reporting Form. Medical device reports submitted to the FDA can be found in the Manufacturer and User Device Experience (MAUDE) database. If you are interested in requesting specific documents from the FDA, please see FOIA. 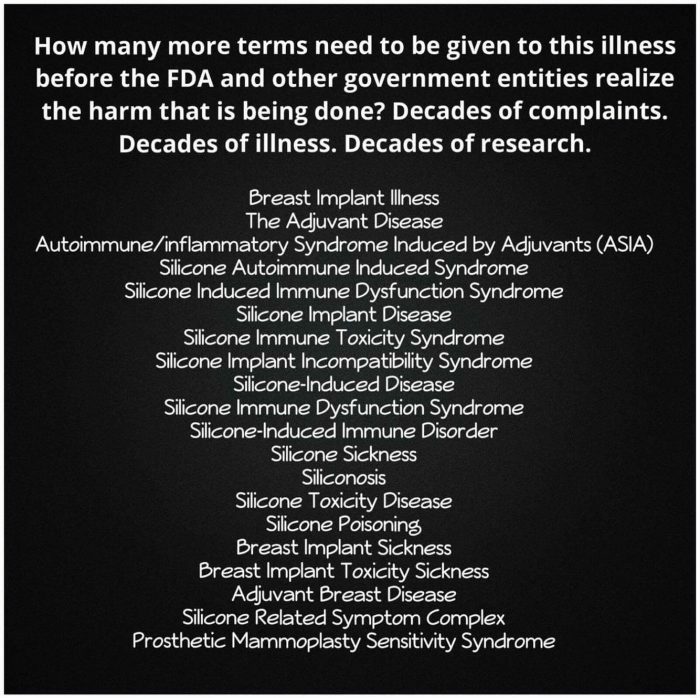 As of March 2019, due to all the reports submitted, the FDA has officially listed Systemic Symptoms (Breast Implant Illness (BII)) as a risk of implants. 2. As of September 2018, the FDA has newly launched the National Breast Implant Registry (NBIR), where data is entered by plastic surgeons. 3. BIA-ALCL cases can be reported by patients to MedWatch and by physicians to PROFILE (BIA-ALCL Registry). For more information on US reporting, see FDA Executive Summary, page 12, Table 3: Existing Data Collection Methods Related to Breast Implants in the US. Canada – Breast implants can be reported to Health Canada through the Health Product Complaint Form. UK – Breast implants can be reported to the MHRA through the Yellow Card Scheme. Australia – Breast implants can be reported to the TGA through the Users Medical Device Incident Report. Medical device reports submitted to the TGA can be found in the Database of Adverse Event Notifications (DAEN). The TGA does recognize the condition. A spokesman for the Therapeutic Goods Administration said Breast Implant Related Illness (BIRI) is a known condition associated with implants (from 9News). Please see the Scientific Articles page for over 200+ references to breast implant related scientific articles. They are organized into eight categories: 1. General, 2. Researchers, 3. Saline Implants & Mold, 4. Ruptured Silicone Implants, 5. Biofilm & Infections, 6. Breast Feeding with Implants and Effects on Children, 7. Biomaterials, and 8. ALCL (cancer). Dr. Pierre Blais (chemist and biocompatibility expert – Canada), Dr. Arthur Brawer (rheumatologist and silicone toxicity expert – Long Branch, NJ), Dr. Yehuda Shoenfeld (physician and autoimmunity researcher – Israel), Dr. Cohen Tervaert (rheumatologist – Edmonton, Canada), Dr. Henry Dijkman (pathologist – Netherlands), Dr. Diana Zuckerman (President of National Center of Health Research), Dr. Sarah Myhill (UK), Dr. Lu-Jean Feng (plastic surgeon – Cleveland, OH), Dr. Victor Urzola (plastic surgeon – Costa Rica), Dr. H. Jae Chun (plastic surgeon – Newport Beach, CA), Dr. Matthew G. Stanwix (plastic surgeon – Henrico, VA), Dr. Marguerite Barnett (plastic surgeon – Sarasota, FL), Dr. Susan Kolb (plastic surgeon – Atlanta, GA), Dr. Edward Melmed (plastic surgeon – Dallas, TX), Dr. Rita Kappel (plastic surgeon – Netherlands), Dr. Michael Harbut (environmental medicine specialist – Detroit, MI), Dr. S V Maharaj (silicone breast implants and platinum expert). See Expert Researchers for some of their publications. Topic: Linda L. Haas, Feng Clinic CEO, answers basic scheduling questions from patients who have just started researching breast implant removal. Videos: Part I and Part II. Topics: pathology, mold/microorganisms, detoxification, coinfections/diseases, selecting a surgeon, silicone vs. saline, capsule removal, lymph node removal, hormones and symptoms of BII. Video and Transcript. Topics: the aesthetics of the breast, muscle repair, mastopexies or breast lifts, fat transfer and who is a candidate. Video and Transcript. Topic: An in-depth discussion of detoxification before and after breast implant removal. Video. YouTube Channel – with videos on explantation, ruptured implants, difficulty associated with detecting ruptured silicone, and an en bloc capsulectomy explant (graphic). Instagram where you can see Dr. Chun’s meticulous skill and expertise in doing perfect en bloc explants. If something is of use to women affected by breast implant illness, it will be provided on this website regardless of politics. Note: There are currently six pending medical malpractice lawsuits filed against this plastic surgeon. All articles on breast implants by Dr. Pierre Blais, click here. Topics include: rupture, cancer, breast feeding, polyurethane, saline implants, cohesive gel, explant problems etc. Dr. Blais is a chemist and expert in the biocompatibility of implant materials. He has been analyzing breast implants and conducting breast implant failure analyses for over 40+ years. There is currently a backlog due to the high demand and he is not accepting any new breast implants. Dr. Blais is a significant resource, he is a wealth of information on most breast implant matters. Did you have breast implants while pregnant? Did you breastfeed with breast implants? Was your child born with a birth defect? Was your child born with a birth defect? The National Birth Defect Registry might be able to help us research any possible link between breast implants and birth defects. If you’d like to help, please go to their website and register. Click here for more info. ***Search here if a doctor is receiving payments from a manufacturer and here (such as fees in research, consulting, speaker, sponsor, etc). See blog written by the consumer representative on the FDA Advisory Panel at the March 25-26, 2019 FDA meeting. Breast Implant Illness and Healing Information by Erin Elizabeth. There are over 160+ breast implant illness support groups and awareness pages on Facebook where women share their experiences. Facebook groups are helpful for hearing feedback from other women, seeing pictures of capsules and breasts, and to provide support with explant. However, it is good to be aware that there is always some level of censorship and undercurrent of politics that vary in severity within each group. Certain posts or comments are swiftly deleted if they collide with admins’ politics in the groups. This is unfortunate and usually happens below the radar which is why it is important for it to be mentioned. In surgeon specific support groups negative experiences, posts/comments are at times deleted and members removed. This occurs in the larger BII groups as well. The Facebook groups listed here have relatively less drama than others hence why they are posted. This website is not affiliated with any Facebook support group and writes this information only to help women be aware. In addition, there were Yahoo support groups and breastimplantsupport.org was another popular forum but now is no longer running. For more information on breast implant FDA links and how to do more FDA research, click here. Oprah on breast implant dangers (October 14th, 1995). Oprah talks with Colleen and John Swanson on the devastating effects of the breast implants she had implanted in 1974. Oprah also talks with Richard Hazleton who was at that time, the Chairman and CEO of Dow Corning, and Stephanie Burns, Dow Cornings Manager of Women’s Health and FDA Issues. Lies, deception, and cover ups. Dr. Cutler has a PhD in chemistry from Princeton University and has extensive study in biochemistry and medicine. He himself got mercury poisoning from amalgam fillings and created these books to provide guidance for detoxification. Bleeding Edge Documentary (Netflix): Examines the $400 billion medical device industry and the profit-driven mind-set that rushes implanted devices into the marketplace. Dr. Britta Ostermeyer testifies to FDA in 2000 on the dangers of silicone breast implants. The Troubled History of PIP’s Implant Man in America **Implant manufacturers all operate in relatively similar ways and this article provides a glimpse of the dirty and corrupt business. Thanks for this resource. A lot of reading to do! how can i put this on facebook to send to someone who has this terrible problem? Hey there! I would love to have our website added to this resource page in the future and we would like to add you to ours, as well! It has been added. Thank you for sharing your stories and raising awareness. Hi, this is Sarah with Reversing Breast Implant Illness. Just FYI, the link to my blog post you shared here is no longer a valid link. I have changed the slug. The link to Reversing Breast Implant Illness has been updated. Thank you for being a resource in the community. This is Dr. John LETTIERI in South Carolina. I have been involved in explantation surgery for almost 30 years and have written before asking to be included in your physician directory. I am very comfortable wth, and have performed over 100 “total explantations“ with great success. Please contact me regarding any additional information that is needed.